Rated 5 out of 5 by kandinsky from Very Fine Game but... Why does H.E.L.P. have its academy in...Budapest? surely not to be within driving distance from the developers of the game? Looks like a pretty permanent instillation too including Sam's very fancy office( Sam plays Miss Moneypenny to our heroine's Bond) which of course we ransack just as freely as players of most of these games,as if kleptomaniacs in training, do any place they find themselves. What are those bones on the cliff side in the lead in video of the game which would seem to be of the Midgard serpent which circles the world? Why am I playing this sort of world saving game? Could or would a major developer take the risk of making a game without all the cliches of the genre? I cannot answer any of these questions but I put them out there together with the agreement to what other reviewers have said that this is a very well made game indeed and ,yes, I enjoyed it and expect you will too... Best in the series? In some ways but I rather liked the Hope Diamond one where the Smithsonian collaborated in the background information. But compared to the games between that and this certainly in my opinion. Enjoy! Rated 5 out of 5 by Manavo from Great game This is a fantastic and fun game. Thank you Big Fish Games. Rated 5 out of 5 by ThreeG from Another Excellent Expedition! WooHoo! I beta-tested this and could hardly wait 'till it's release. I didn't even play the demo - the game is downloading now and I can't wait to really take time to play and savor each scene. The game is everything Sunnyglow said and more, and since I couldn't have said it better, I won't. I've always liked the Expedition series and this one will be hard to top. Thanks, Eipix! Rated 5 out of 5 by gobaba from Really a 4.6 But I'm Not Going To Be Stingy Based On Main & Bonus Games Make sure you have your donuts and coffee because it's time to save the world from another maniac, this time nicely attired in a fashionable get-up. Eipix has done a great job on graphics, scenery, audio, voice-overs, lip-synch, music, cut-scenes (just long enough and have the "wow" factor too), and a storyline to hold interest. Though as usual I forget everyone's names and get lost. It's balanced more in HOs and puzzles than usual, though Eipix is usually puzzle-heavy. The HOs are widely varied to keep interest. The puzzles are part of the reason I gave it a higher rating and added to length of time, because they get much harder as the game progresses, plus several are new. Yay! Adventure part was pretty linear though a couple of times I was not sure where to go. There are 43 Thor hammers to find = 43 scenes = large game. Jolly good. There are 15 cards to find which stand out easily. Morphing objects are in HOs. You can go back and find hammers in Extras if you miss them in gameplay. Not sure about morphs because I got them all. CE bling includes the Souvenir Room, which is a mini-collectible hunt. It's gotten more challenging, and is an excuse to go back and look at the scenery artwork. At least for me. Also included are replayable HOs and puzzles, the Collectible hammers, achievements and the usual. I play in "No Mode". No hints, no skips, no map help, no SG peeks. So if I give you a game length, keep that in mind. The main game lasted six hours. The bonus game lasted 1.5 hours and was a slightly different story. Is it worth a CE? Even though this is really not my favorite game genre I do like Eipix' extras: the collectibles, the Souvenir Room, and the morphs. Plus I do think some of those head-banger puzzles were worth a replay. I'm going to say yes. As always, demo if you're not sure. Rated 5 out of 5 by cuorips from Engaging, modern,interesting ! Once in a while there is a good one, and this one is very good ! Puzzles are challenging, Ho's are different, we got morphing, and above all an interesting end of the world story. It is an engaging game, you want to stay with it. It is an intelligent game. It is modern, as for once we are not in the 18th Century with purple black smoke,in a carriage, trying to rescue some damzelle in distress locked in a cage. I am tired of damzelles in distress, I want to see 21 st century women in charge kicking butts !!!! Rated 5 out of 5 by alowan from A short review! A short review: It took me an hour to play the demo. It felt like 10 minutes! Graphics: up to Eipix’s good standards! Music: very suspenseful. Voiceovers: far from amateur. Game play: fast & furious. HOPs well done. Puzzles: take pains to get them right. That’s some fine Dover Sole! *** My scale: Dover sole: I must have it, now! Smoked trout: delicious, but not quite as yummy as the sole Finnan Haddie: worth having Fish cakes: only if there’s nothing else in the house Fish sticks: where’s the garbage bin? 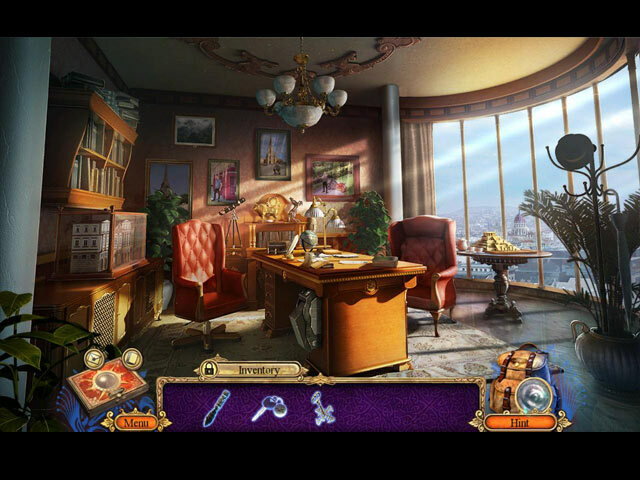 Rated 5 out of 5 by biscuitsmama from FOLLOW THE CLUES IN THIS ABSOLUTELY AWESOME HIDDEN EXPEDITION GAME Get ready for an exciting new Hidden Expedition as you discover the secret that Dr. Schumann fpomd24 years ago. As a top H.E.L.P. agent you will work with Sam to uncover the mystery of Dr. Schumann’s work. Things really get off to a bang in Midgard’s End as the bullets start flying and there is a theft at SAGA headquarters where Dr. Schumann’s daughter, Helen, is giving a lecture to a group of future H.E.L.P. agents. 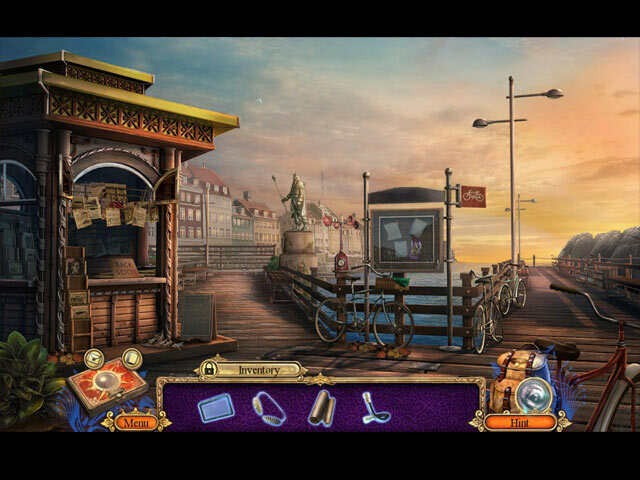 Trek across Europe and Scandinavia as you play this wonderful and exciting new Hidden Expedition that will at times leave you holding your breath and at others solving challenging puzzles and searching for hidden objects that will help you in your adventure. Of course with the game coming to us from one of the best casual game developers you know the graphics, sound and other technical aspects will be top-notch. The game has a custom mode of that allows you to tinker with various options to set the gameplay just the way you want. Hints recharge in a range of 10 – 120 and mini-game skips in a range of 10 – 400 seconds. You have an interactive map that is present at the beginning of the game. You also have the H.E.L.P. toolbox where you can find your objectives and store information. The HOPS are well-crafted and at least one of them seems new in style. The HOPS seem much better than in the past and I found them quite enjoyable. The mini-games are excellent and not as easy as they appear at first glance. Some of the mini-games are this devs favorites such as placing queens on a board so that they are safe from attack by other queens. I found some of the mini-games to be more difficult than usual so at least this developer has heard the call for more difficulty in their HOPA games. 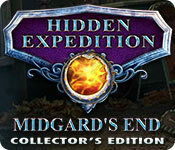 With great HOPS and terrific mini-games Midgard’s End is a worthy entry for the Hidden Expedition series. The CE version offers the following extras: 43 collectible Thor’s Hammers hidden throughout the game, 20 interesting H.E.L.P. cards are found in some scenes, and 15 morphing objects can be found. There are also achievements to earn. The other extras include replay of mini-games and HOP scenes, a Souvenir Room, Concept Art, Wallpapers, Strategy Guide and the Bonus Game. IMHO, this is one of the best Hidden Expedition games and it is probably one of the best games I have played in several months. The game is exciting and gets of to a fast-paced beginning and holds the momentum as I played through the demo and beyond. After playing the game’s beta release, I have been waiting for it to hit the BFG market. Now that it is here, it is an instant buy for me. I love this game and as I mentioned above think it is one of the best Hidden Expedition games ever. As always, I recommend that you at least try the demo to see if this is a game you will like. Rated 5 out of 5 by pennmom36 from TEARS OF GOLD Freyja is the Nordic goddess associated with love, beauty, fertility, war and death. She rides a chariot pulled by two cats with a boar by her side. Freyja rules over the heavenly afterlife and receives half of those who died in battle (the other half go to Odin's hall) and has been known to help deities who often use her cloak made of falcon feathers. Freyja's husband is often absent which saddens the goddess, causing her to weep red gold tears for him. It is those tears that are capable of destroying the world and even the gods themselves, and those tears are being sought out by someone within the SAGA organization who will go to great lengths to find them. This is going to be the most crucial case the H.E.L.P agency has ever embarked upon, the world depends on you to to stop these madmen before they reach their destination, Midgard's End! Looks like were going to have to step up our game, because Sam has just been promoted! This is quite literally the best Hidden Expedition to date, just when you think this series couldn't get more action packed and intense, they up their game. As with all Hidden Expedition games, there are collectible Fact cards that give you interesting facts about items associated with the theme. There are also 43 Hidden Signs, one in each scene to find throughout your adventure, as well as 13 Achievements to earn. 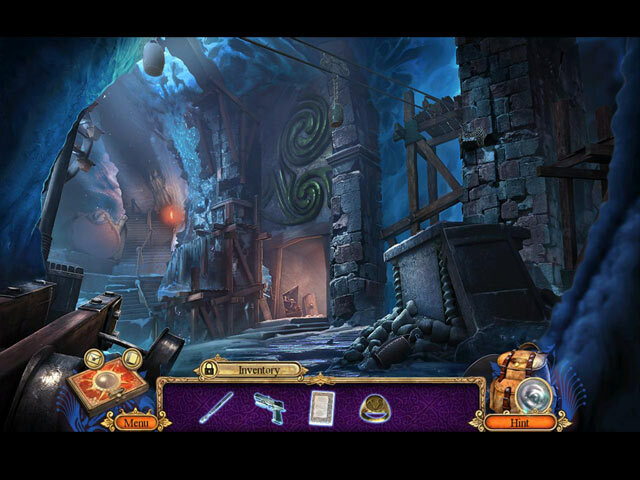 The Hidden Object Scenes are extremely entertaining and take place in some unique places with unique features. There are Interactive List finds, Sketch finds and even items to find from key words in a speech given. Each scene has a Morphing Object to to add a little challenge. My favorite was finding and interacting with items by opening up different rooms of a miniature house. The Mini Games present a nice challenge as well, below are brief descriptions of some of the games you'll encounter during the demo: 1) Connect all the nodes without crossing lines. 2) Move boxes to their correct positions, boxes can only move in the direction they are pointing but they can move other boxes into place or change directions by landing on a cog. 3) Plot a course on a map using directional arrows. 4) Rearrange wires using clues shown to cause a short circuit in the Cabaret. 5) Arrange Queens on a chessboard so that no queen can be taken by another either straight or diagonally. This Collector's Edition has 17 replayable Puzzles, 15 replayable HOP's, 11 Videos, 8 Wallpapers, 12 Concept Art Pictures, a Souvenir Room, 13 Achievements, collectible Fact Cards, 15 Morphing Objects within the HOP's, 43 Hidden Signs, a built in Strategy Guide and a Bonus Adventure, enjoy! Rated 4 out of 5 by Innerl from Excellent game..but buyer beware...very short, as most other EIPIX game have become lately Excellent game in the series, if you don't mind spending the money for such a short game. EIPIX game have seemed to be getting shorter and shorter, and this is no exception. I was done with the whole game in less than 3 hours of game time. The length of the game was the only negative I could come up with. Excellent story, HOP's, graphics. As is the case for the majority of the hidden expeditions, excellent info provided throughout the game on other ancient sites. Rated 4 out of 5 by lbtgam222 from Full game and Bonus It was an OK game, nothing really new, but had the usual high quality bling I normally associate with Eipix games and was a nice continuation to the series. Story was kind of disjointed, but IMHO if you want a great story, go read a book, don't play a game. The puzzles and HOPS were very good, which helped me give this game four stars. Judge for yourself fishies! Rated 4 out of 5 by Torpedo1 from Bring Out The Mead This game has a bit of everything. Loved it. Could be contender for game of the year. Goes hear the top of my to buy list. Nice game flow with decent abidance. Lots to do, Different types of HO's, Good Characters as well. Very nice addition to this Series. Rated 4 out of 5 by dancemom1 from Excellent game and different story line... Hi all! Wow, this will be #10 in this series! I only have 7 so far, but that will change shortly. I usually only review on the game play and not the story line, as others do a much better job on that than I. The graphics are excellent, very clear and clean. Colors are very nice, although a bit muted in some areas. Still, not enough to spoil the game or scenery. Game play was quite good, with no problems during the demo and the scenes fit my large screen completely. The voice overs, although not a lot, are well done and are age and character appropriate. Music was nice and moved with whatever was happening at the time, adding a little suspense now and then. Sound FX are well done and are throughout the game, so there are no "dead silent" areas that I found. HOPs are a very nice combination of find the highlighted word; interactive lists and straight lists. The scenes are quite clear and items are not difficult to find. I did not see that you could switch to something else if you didn't care for the HOP, but there is such a nice combo that I doubt you would want to. Puzzles were very interesting and somewhat different. They do take a little time and thought, but are not all that difficult. Still, there is some challenge...yay, and they can be a little frustrating! I do like the addition of the "undo" button on the puzzles. This is a nice change from needing to completely start over if you make a wrong move. Of course, you can still do that if you want. SG is the same as all other games. You do transport to longer locations, which is a good thing, as you are constantly on the move. This was not frustrating or boring for me, as there is a lot of action in this game to keep you interested in what you are doing. I did notice that on some items, you have to be precise in our placement of the item in order for it to "fit" and activate or become useful. Don't give us too quickly if it doesn't work the first time, e.g. placing wrench directly on the connector on the bike to remove the hose. There are others as well. A number of collectibles: 15 morphing items in HOPs, which are easy to miss. Keep a eye out. There are 43 hidden signs that look more like an alien than a hammer. These are well blended into areas and can be different colors. This is a challenge. We also have 20 fact cards that give us information on areas and things within the game. Interesting, but... I really like this series and this game is no exception. As I said, there is a lot of action to keep you interested, there is challenge, and the story is a little different than most and very well done. I think all levels of players will find this one interesting and fun and yes, I am going to add it to my collection (and now I have 8). I do not give 5 stars easily, a game has to be exceptional to get them. This one was close, but not quite...I gave it a 4.75. As always, try it for yourself and see what you think. We all have different tasted in games and you may not care for this one at all. Thanks for the reviews. Rated 3 out of 5 by fiewi1 from It has its moments, but... I always have a... (negative) thing with the Hidden Expedition series. I don't know. I guess it's not my style, artwork-wise. Plus its logic puzzles are either great or crazy difficult and not fun at all without any particular reason for it. Plus, I don't really appreciate when the Bonus game is a repetition (at least 50%) of the main game; same scenes, same places where you have something to do or find... I mean, it's a solid game, but not sooo much enjoyable as others. Rated 3 out of 5 by Granny_Gruff from Was there a story? I am a H.E.L.P. agent. I am at a lecture by the head of SAGA. A sabotuer gases everyone at the meeting. I set out to catch him/them. Sam, my colleague from earlier missions, is around to help. Unfortunately from that point on, I can't tell you what was going on. There is a bit of animation as an opening, but no connection between that and the game other than the fact that the character in the opening animation is apparently the father of the lady in charge of the ill-fated meeting - for all the info actually in the game, she could have been sister, wife, or daughter. And he was in Norway which may have some connection to the bad guys. Good stuff: All normal game elements and CE bling are present, along with four levels of game play, morphing objects in the HOPs, and collectible "signs." Bad stuff: Between the absence of a story-line, lack luster VOs, and totally pedestrian game play, there isn't much going on here. I have all the Hidden Expedition Games up to this one. Sadly the last several games in the series were two to three star games. This one is no better. Fond as you may be of earlier games in the series, play this demo FIRST. Rated 3 out of 5 by eupmp14 from Not as good as the older Hidden Expedition Games Previous games a lot more entertaining. Liked them more before the we got all the help from H.E.L.P. Rated 3 out of 5 by mmdgaston from just ok.... i beta tested this game months ago....i see they changed some things. this was a very boring game, just like the last few in this series...... the puzzles were easy, nothing new. the storyline stayed for the whole game. you have little shields to collect,some morphing objects.....thats about it. Rated 3 out of 5 by SrRat from Meh... It was OK. I've played each of the Hidden Expedition releases, hoping for the same fun/HOS quality of the first three issues. This one has promise but I lose interest when the adventure aspect is so prevalent. I liked the puzzles very much. And what HOS there were were quality. But I won't be buying it. Good for one time. Rated 2 out of 5 by Liria from difficult to see The writing fades into the background and is very difficult to see. There are also flashes of light during the levels which drove me crazy! I didn't even get through 4 levels. Rated 2 out of 5 by nextgengranny from Someone wake me up when I'm done playing. I had to force myself to finish this, & I can't imagine replaying it (by contrast, I got Leviathan's Reef on the same deal, & I've played the main game through at least three times already). Given the sort of story this is, I think I expected a little more logic, & definitely much more interesting things going on (as opposed to, for example, being dispatched by my boss to do something requiring a password, & spending the next "x" amount of time crawling all over the complex looking for it, since he failed to provide me w/ it). The graphics are okay through Copenhagen, after which point they drop below average; the static Aurora Borealis, in particular, was a missed opportunity to create something truly memorable. The HO scenes are more interactive than I'm used to seeing from Eipix, & many of the mini-games are more challenging, as well, which counts for a lot w/ me...unfortunately, the overall game just seemed really boring to me; very linear, & just sort of plodding along (not to mention, if you're going to give me a robotic arm, please have me use it to do something more interesting than unscrewing a light bulb). As other reviewers have mentioned, it's also not a very long game. The "Arctic adventure" touted in the bonus chapter is actually just a return to previously played areas, w/ maybe two new areas added on (out of ten). I do applaud the developer's efforts to up their game in some respects, but given how much store I set by replay value, this game doesn't cut it for me. Rated 2 out of 5 by tonjadillard from Not my Favorite One This is my least favorite of the Hidden Expedition games. It was boring and short! Very Short. I was disappointed in this one. Sorry I bought the Collectors version. Sorry I bought it at all in fact. Rated 2 out of 5 by bfeinstein from A story that makes no sense. A game that is pedestrian. Skip it. I had high hopes for Midgard's End when I played through the first HO puzzle. Every item I located needed to be found for a reason. I was genuinely excited. It looked like the designer gave real thought to the game to create meaningful context for the puzzles. But that HO puzzle is the high water mark, because it is all downhill from here. Nothing new to see here. The same old puzzles. Uninspired graphics. That would be OK, but the story line makes no sense. From the opening scene featuring the gassing of an entire auditorium from a small horse statuette to a lingering dispute between the agency head and her missing father that would be best hashed out in therapy, to obscure references to Norse mythology, the whole thing is a disjointed mess further deadened by wooden voice acting and poorly animated cutscenes. And then there are the silly things. You need a heavy object to hit against a screwdriver to open a lock. Great news! You have a heavy pipe! Problem solved, right? No, of course not. The game says the pipe isn't good enough. But what the pipe IS good enough to do is leverage off a piece of concrete that you then use as the heavy object against the screwdriver. Not only is this absurd, things like this kill the immersive quality of the game. Every game is fantasy, but you have to keep the absurdity down to keep people engaged in the world being created. Of course you have the usual tropes--keys left here and there since no one in these games owns a key ring or can otherwise take a commonsense approach to holding onto their basic belongings. Indentations that need to be filled with objects. The usual is there. One day, one of the developers of these games will decide to rethink the genre and offer something new. Today, like so many others, was not that day. Not worth the time nor the effort to play this one. Rated 1 out of 5 by kellybg1978 from Not at all up to the same standard I've played all of the Hidden Expedition games and enjoyed them all immensely. This one was just terrible. The storyline was predictable, the puzzles were boring, and overall, the quality was just lower than I expected from this franchise. If you have to get this game, wait until the standard version comes out. Otherwise, I'd skip this one altogether.